Kanzuri, the traditional seasoning sauce from Niigata's Myoko City, is made extra spicy by fermenting chili powder for three years. 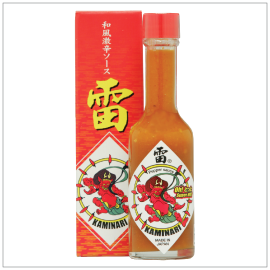 The Red Kanzuri is made by mixing in what was called "the world's spiciest" pepper, Habanero. 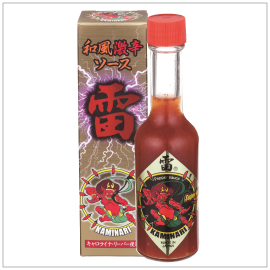 The Kaminari (Gold) version is prepared by adding Carolina Reaper hot peppers, certified in 2013 as the new "world's spiciest". Instead of vinegar, soy sauce is used as a base, allowing it to pair better with Japanese cuisine. Gold Wafu Gekikara Chili Sauce Ingredients: Soy Sauce (Water, Soybean, Wheat, Salt), Carolina Reaper, Chili Pepper, Rice Koji (Molded Rice), Citron, Salt.